1.8 Better Vanilla mod on hold! The next thing comes once I'm done and the download is avaliable. It'll be mob abilities. sorry but can you give me a list of what's done right now? Zombies can spawn other zombies right of the bat when they see an enemy. The buff perk, however, certainly sounds interesting. Creepers throw TNT as a special attack. Spiders can leap at you and trap you in Webs. Skeletons will shoot a ton of arrows for a short period of time as a special. 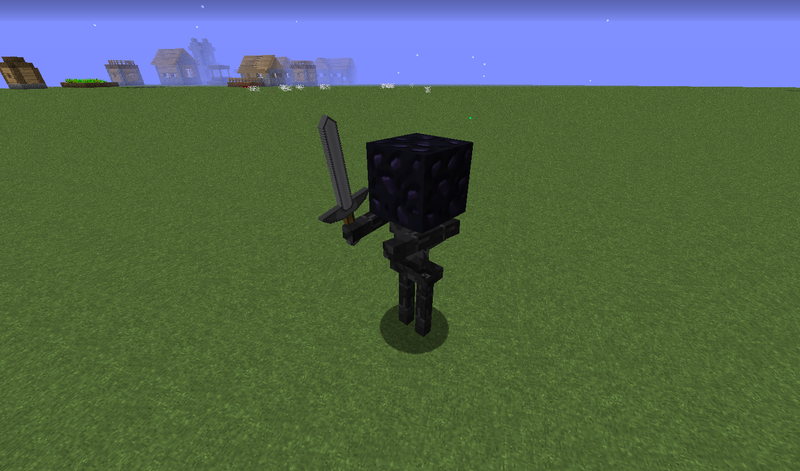 Endermen can scream to inflict negative buffs on you to confuse you. Silverfish can now overrun you even easier with their ability to spawn more silverfish, like zombies. Never thought about the Zombie Pigman one you suggested. It sounds really good. In fact, I feel that should be in the mod! I think for others like blazes, ghasts, witches and cave spiders, I'll have to come up with something. Feel free to provide suggestions. When the blazes move they release magma powder that burns and slows them down.The blazes also get mini explosions to come with their fireballs. The witch straps 3 potions together, and the splash potions give 3 random bad debuffs. The witch also gives herself resistance I, to counter her slow attack speed. The spider sprays her enemies with a green spray, which gives Wither II. The spider also lays eggs to produce more spiders. Whenever they hit mobs, the enemy is in a green "goop" and is slowed down by Slowness II. They also leech health whenever they hit mobs-usually 1 heart. Also, will the Human have anything special? Perhaps picking up swords/armor? Guardians are able to 'chase' you when on land, and their beams concentrate longer if their target doesn't move too close. Their spines damage you if you touch them. Blaze one sounds pretty good. The explosive fireballs are already implemented, but they only shoot those on Hard mode. Cave spiders use the same abilities as normal spiders, but the poison spray certainly sounds like an ability they would have. Slimes can completly absorb killed mobs. The health leeching makes perfect sense, however. Slowness II might be much for Magma Cubes, but sounds good for Slimes. Magma cubes could also light you on fire. For the homing fireball, that might require some more time. Feasible, but probably difficult. Not going to be a problem for me. Also, think up abilities for these mobs: Dispenser Creeper, Ender Creeper, Iron Golem, Snow Golem, Withers, Ender Ghasts, and Giant Rats. Near death, the dispenser creeper shoots a volley of arrows,snowballs, and fireballs. It is also invulnerable for a short period of time. It spawns 3 clones that explode after being hit. After these clones disappear, the ender creeper goes and tries to destroy the player.The ender creeper alos, as a given, has all the characteristics of endermen(water). It creates a large earthquake that radiates from the center and does around 9-12 damage. The enemies are stunned for a short time if they get hit by the earthquake. The snow golem creates a aura in which all golem mobs heal and get buffs such as Strength I.The snow golem always deals damage(2 hearts) no matter what. At low health, it begins to summon 5-7 minions(any undead mob here). For a short time, the wither heals from the minion's attacks. It shoots twice as fast, and it shoots dark fireballs that teleport their enemies away if they get hit. If there are many giant rats in proximity of each other, they give each other buffs like Strength I and Speed I. These buffs immediately stop after they get away from each other. BTW, anything about humans? new things about em? Humans will be one of the few mobs that doesn't have a special attack. All those sound good. I had to replace the Ghast's homing fireball with an inescapable explosion because the model I tried to make for it failed to render. Should think of multiple special attacks for the Wither. It's a boss mob deserving of many specials. I'm going to add gameruleExplosionDamage for things like that. I find unbelievable that mojang haven't already made a gamerule that affects TNT. It gives buffs to nearby undead mobs. It also damages all non-undead mobs in it's radius. 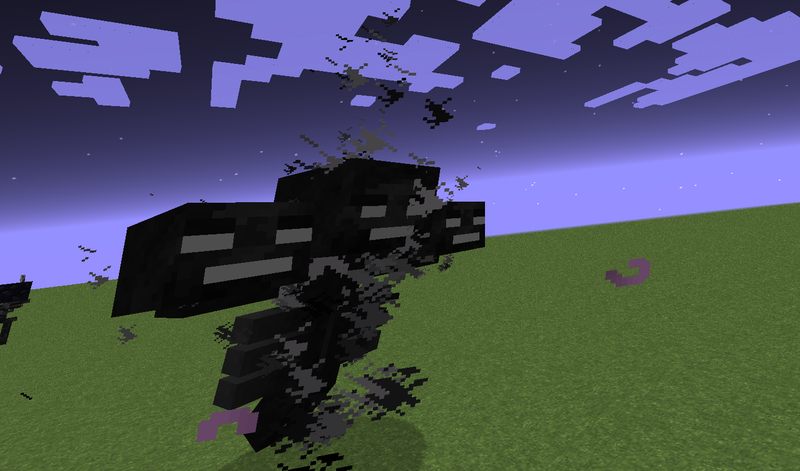 The wither now attacks twice as fast, and begins to summon undead mobs. Begins to accelerate undead mob spawning, and the explosions from the wither are much more bigger/extreme.The skulls debuff enemies that get hit. These abilities can be for generic Withers (that stands for all types of Withers). Now trying thinking up one ability for "Evil" Withers, and one for "Good" Withers. The only difference between the two is that the evil ones attack everything except their minions and each other, while the good ones obey the peace treaty system. B.T.W. Thank you, dude. I've never met someone so willing to help me. You're being very helpful right now. Nefarious presence:The skulls have a chance of corrupting the "good" mobs,and the skulls occasionally have a chance to stun. As the wither kills more and more mobs, it gets more and more boosts(up to Strength II and Speed II). It also leeches life from those "good" mobs that get hit. Paladin's strike:The good wither shoots a large skull that creates a profound explosion while healing the good wither. 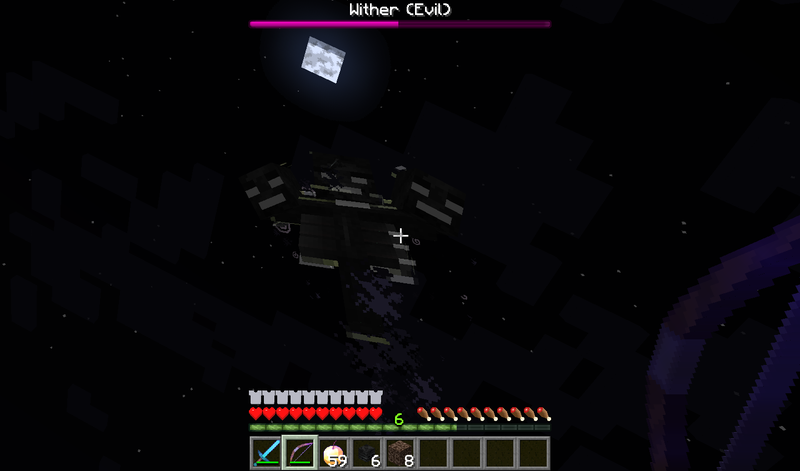 The good wither also has a constant Regen I effect that cannot be debuffed. Also, what's after these abilities? Those abilities look good. I think good withers doing bonus damage to evil ones is also called for. These abilities are all offensive, and that's what I want. I'll notify you once I'm done coding in all this helpful information, then I'll post an image. Actually, their is one more mob I forgot to mention: THE ENDER DRAGON! Go wild on this one. Minimum of 6 abilities, but provide any extras you see fit for the final boss of minecraft. Don't use fireball, as I've already got that one in. OMG! I've made the "Evil" Wither with the abilities you suggested(plus some others I added like that it turns to nighttime when the Wither is in the world, he gives you nausea when your close to him, and that his regan and armor go up when he's half way down. )-Oh My God is he tough! Spawning his minions all the time, making it very difficult to aim thanks to the nausea, the heavy amounts of damage he deals, and he even heals from whatever health I lose to his area damage effect. Man, this fight is NOT for the light of heart. Hitting hit when he is at half health if like hitting a player in full diamond armor. It stays near the ground stationary for a while and regens quickly. However, a attack stops the regeneration. The enderdragon shoots much more powerful fireballs and spawns mobs near it. Minimum of 6. Your half way. Any less and the final boss of minecraft would be too easy, by Better Vanilla standards. These all sound really good, and I hope I can get them to work. It reverses time, making projectiles shot by mobs and player slower, and the ender dragon goes twice as fast.However, it becomes slowed after this period for using tons of energy. It begins to have a dark aura, giving it resistance I and it also gives nearby minions buffs. With all it's strength and ability, it fires off a laser that strikes it's enemy and gives it 2 random negative debuffs. Hill giant and bug bear abilities? Also when is a "beta" version coming? When someone converts the finished .java files for me. How are my ender dragon abilties? also bugbear and giant hill monster abilties? You might need to recruit people for that convertion. They're good. Yes, abilities for hill giants and bugbears. If you can, think up two more abilities for the Ender Dragon. One that has to do with their being no ender crystals, and another for when it's health is below 50%. also one for the endermite. Not to big, but something that will make them more challenging rather than their present annoyance.